Well, not a contest really, as I have no prize to give other than praise. I thought that some of you might want to play along. What's the best caption for this picture? "you cant tow THAT with that!" "Geez! 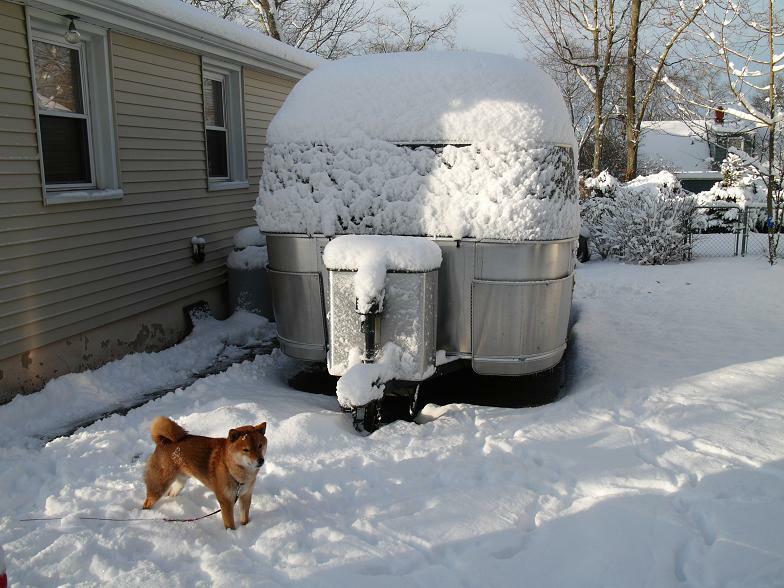 I know Airstreams are lightweight and all, but I am NOT pulling that thing without my full team and a new set of snow shoes!" "OK, where'd you hide the grass?" First off - that pooch is gorgeous! "What Do You Mean... No Yellow Snow?" "Boy, Someone sure got carried away with the leak test soap this time!" "Sorry! I was only trying to cover my poo." "I just can't wait for Spring!" WOW! It snowed last night.... Now where the heck did I bury that bone? Brrr! It's sooo cold out just look what it did to my tail! Hey, Look over there. Those dang squirrels are making snow ice cream! Boy oh Boy, Master when you say Freeze.... You really mean it!